World-renowned artist Shahabuddin on Sunday said Bengal is ahead of other countries in the subcontinent when it comes to artworks. 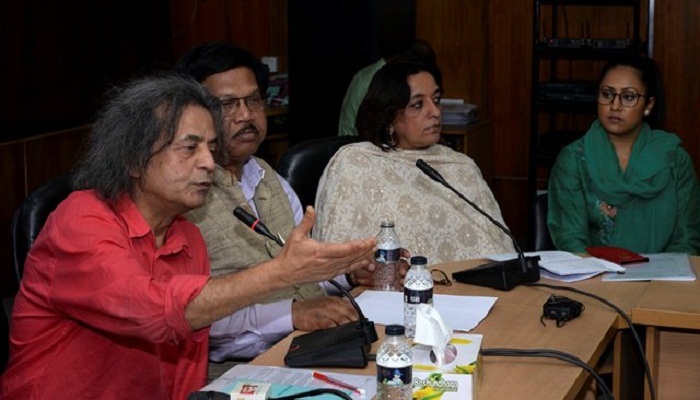 Speaking at a press conference ahead of the opening of his solo exhibition titled “Shanti” at the Bangladesh Shilpakala Academy (BSA), he said although the styles of artworks vary from region to region, a sense of harmony exists between the artistic “gharanas”. The month-long exhibition is slated to be inaugurated on Monday by Prime Minister Sheikh Hasina, at the National Art Gallery of Bangladesh Shilpakala Academy. Ganges Art Gallery, Kolkata in association with Bangladesh Shilpakala Academy is arranging exhibition featuring artworks derived from a 20-year span of iconic artist Shahabuddin. During his speech, Shahabuddin also refuted popular claims that he only chooses political subjects. Given his experience as a freedom fighter in Bangladesh’s War of Liberation in 1971, he had witnessed a lot of harrowing incidents which led to his use of particular individuals, such as the Father of the Nation, Bangabandhu Sheikh Mujibur Rahman. Director General of BSA Liaquat Ali Lucky said it had long been their dream to exhibit Shahabuddin’s artworks for the new generation who is not familiar with the artistic prowess of one of Bangladesh’s contemporary master painters. He considered the artist to be one of the few individuals who had protested the gruesome murders of Bangabandhu and most of his family in August 1975 through his artworks. Professor Abdul Mannan, a former MP, said Shahabuddin cannot be compared with anyone else. His patriotism is also unparalleled, he added, as he refused to submit his Bangladeshi passport despite being given citizenship by a foreign country. Smita Bajoria, director of Ganges Art Gallery, said an artist of Shahabuddin’s stature has the ability to transcend borders, as he is equally popular in India as he is in Bangladesh. Among others, Jahangir Hossain Chowdhury, secretary, BSA, Ashraful Alam Paplu, director, department of fine arts at BSA and Nahar Khan, Director, UNB were also present on the occasion. Shahabuddin stressed the importance of practising and striving for artistic excellence to the young generation of artists, if they want to accomplish something in the field of art. Thirty-two selected artworks will be up for display, which will depict the artist’s affinity with Bangladesh’s War of Liberation, his fascination for Bangabandhu and other recurring themes Shahabuddin is well-known for. Earlier on February 18 last year, former Indian President Pranab Mukherjee had inaugurated the same exhibition at the Rashtrapati Bhavan in New Delhi. It was also previously exhibited in Kolkata and Mumbai. A protegee of late Prime Minister Sheikh Mujibur Rahman, Shahabuddin is a revered national figure and recipient of the prestigious Independence Day Award from the Bangladesh government for his contribution as a freedom fighter in the 1971 Liberation War of Bangladesh. In 2000, the government of Bangladesh hounoured Shahabuddin with 'Swadhinata Padak', while French government conferred upon him the prestigious civilian award Chevalier de l'ordre des Arts et des Lettres (Knight in the Order of Arts & Literatures) in 2014 in recognition of his outstanding contributions to the nation’s cultural clique.